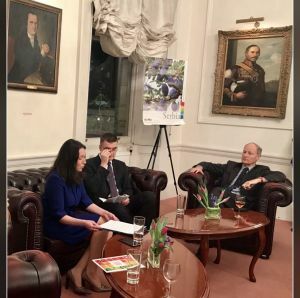 The economic potential of the Republic of Serbia was promoted at the Embassy, on 21 March 2018. 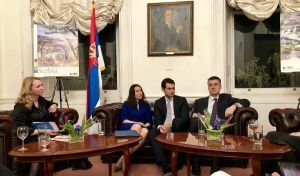 The event was organized on the occasion of the visit of the London Southside Chamber of Commerce delegation to Serbia, which will be held in May this year. Opening the meeting, Chargé d'Affaires N. Marić presented the benefits of investing in the Republic of Serbia and gave a brief overview of the cross-section of political relations between the two countries. 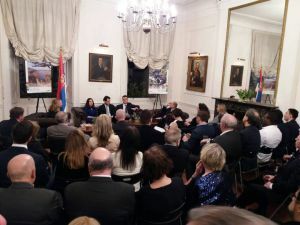 During the evening, the audience was also addressed by J. Dervisevic Kitarić, member of the Board of the Business Council of the Diaspora of the Serbian Chamber of Commerce, Dr. Milos Starović, director at Merrill Lynch International, Bojan Popović, director of Mineco Ltd and Timothy Pool, international trade consultant from the British Ministry of International Trade. 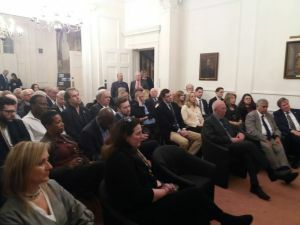 The participants presented the experiences of British companies in the Serbian market in the fields of mining and financial sector, as well as the potential of investments in other sectors - IT, tourism and agriculture.